Care for a spot of tea? These tender morsels melt into blissful tea blends. 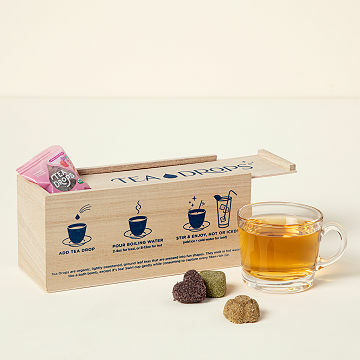 Skip the arsenal of steepers, tools, and tea bags with these dissolvable, shaped tea drops. With nothing more elaborate than a cup and hot water, these organic morsels of finely-sourced tea, sugar, and aromatic spices meld in perfect harmony to create a blissful tea blend that can be enjoyed any time, anywhere. The sampler set includes 5 drops each of: citrus ginger, blueberry acai, rose earl grey, sweet peppermint, and matcha green tea, all in a keepsake wooden box. It's a perfect gift for avid tea drinkers, busy professionals, and even outdoor types who want to take a healthy and convenient beverage on the go. Teas sourced from around the world; hand assembled by Sashee Chandran in Los Angeles, California. With Sri Lankan and Chinese roots, Sashee Chandran has always considered tea a pivotal ritual in her life. "I was always drawn to the intimate and communal nature of tea, and its ability to strengthen the bonds of friends and strangers alike," she says. Through her natural inclination to make, share, and talk tea with others, she came across many who found the traditional tea rituals too daunting or time consuming. Her tender drops initiate an all-encompassing experience with the rich taste and tradition of loose tea, and a pinch of raw organic sugar for a no-fuss preparation. Drink in more of Sashee's story on our blog. Use one tea drop per one cup of boiling water. Use a spoon to mix the tea for 5-10 seconds. Let the tea sit and dissolve for 30 seconds. Due to the use of genuine tea leaves, some sediment at the bottom is expected and drinkable. Great gift for those who love tea! It is perfect except that it is already sweetened. Can you make these without the sweetener? It's too sweet but I love the concept. I LOVE getting away from cookie-cutter gifts! My daughter is a tea aficionado and I like the fact that there are no teabags or strainers involved. A very unique way to taste different teas without the fuss! I purchased another item from this store as well, and my daughter was extremely pleased with it. We both love that the items are from places all over the world. Cute packaging with a little guide to each type of shape, much like what you would find in a box of chocolates. Three of us tried it and we all thought they were a bit too sweet for our tastes. Delightful, Tasty and Convenient ! Was so delighted about the box, then the taste ! Really good, so convenient, have GOT to get some of this for my tea loving Auntie and friends. They will LOVE it ! These are so great because it travels well! What a great reason for a tea party!